although Hydro might let that slip by as its your first post and you are a new member. pretty cool mount Hydro, its sort of an ecological equivalent of an elephant on thier planet, the two large tentacles would be like trunks and the two smaller ones (which seem almost vegistal) could be to just assist with food. ether way awsome creature and the way your building up a really advanced fictisious mythology about them is great. LOL its cute inkboy but whats with the horn and the frill on the back. the frills is because i bought the alien quadrillagy last week. and the horn...because..its mighty. its a show pony version, that breed on a basis of sexual selection and thus being fancy?? any why 2 nostirls (on on the nose tip and one above its eye... hey and where did my other little eye go? Isn't the "Indian" in fact a horribly mutated Naucean who was banished from his tribe and started mutating things, like the elephant-creature he's riding? Oh i forgot to put this before but since i am going to post info on the astronomy of my solar system i though i should post this first. 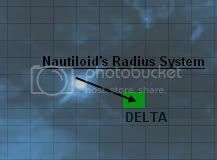 The Nauceans are located in the delta quadrant at (-13, -13). 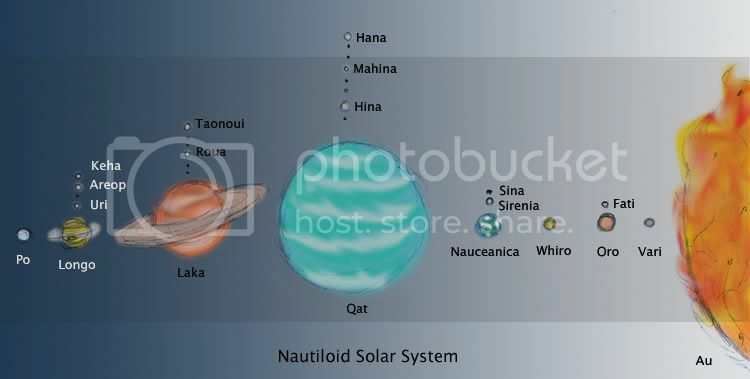 Here is the Nautiloid Solar System. Its sun Au, is a red dwarf star 1/3 the size of Earth's sun. Not shown (but shown in the Planet Spore Galaxy chart) is a blue giant which is 8,000 Light Years away. To put ti in perspective Since it is so huge it will appear to be 3 times the size of out sun in the Nauceanica sky while the home star Au will appear as only about 1/4 due to its size and distance. Thus most of the solar radiation actually comes from the Blue Giant rather than the Red Dwarf. Vari the closest to Au and the fastest orbit. It is the smallest planet. Oro is the 2nd planet from Au and is a scorched planet with no atmosphere either. Its is slightly smaller than Nauceanica and has one scorched moon, Fati. However it is very volcanic due to the pull of its moon shifting the molten plates around. Whrio is the 3rd planet from Au and is a greenhouse planet much like Venus. It has no moons. Nauceanica is a tropical ocean planet where the Nauceans live. It has two moons, Serina and Sina. The moons make for great tides and the planet its self is moderately volcanic. The moons however are not volcanic. Quat is the largest planet in the solar system. This takes most of the hits from asteroids and commets that would hit the inner solar system. It has 8 moons but only the largest Hana, Hina and Mahina have been seen by the Nauceans thus they are the only ones named. Laka is alot like Saturn in that it has huge rings. It also has 6 moons but only 2 have been seen/named, Roua and Tanonoul. Longo is the smallest of the gas giants. It has one small ring and 4 moons but only 3, Uri, Areop and Keha have been seen/named. Lastly the planet/moon Po is a small cold iceball which actually melts when it gets closer to the Blue Giant near by. Durring this time it blooms with single cell life. Then in the colder times it is solid ice and the cells go dormant. Sadly nothing beyond single cells can survive here. 1st Quarter of the Year - Hottest Day with 2 suns in the sky, Darkest Nights. really cool solar system, however 8,000 light years is extremely far away and wouldn't affect the planet at all. if you mean something like 8,000 AU or 80,000 AU, then that would work better. I'm not sure about the scale in AUs and the gravitational pull of the blue giant, but its certainly close enough to affect the planets seasons. Then it must be a really gigantic star. Ok i croped out my portion of the galaxy and the surrounding squares. Each square is 2,000 x 2,000 light years. Which makes its aprox 6,000 light years (I miss counted ince there are 3 squares over [3x2,000 = 6,000]) to that Blue Giant Super Nova thingy. From the looks of it the star is self is like atleast a lightyear across. What do you think should be its size to be enough to warm my planet. as far as I know, its physically impossible for a star to be a light year across. I don't know anything about the physics of stars warming the local area, but I do know it wouldn't work over 8,000 light years, if it did then the several giant stars within 1,000 light years of the sun (Betelgeuse, Sirus, Procyon to name a few big stars) would affect us and they don't, although yea theres the myth about Sirus the dog star, but thats all it is, a myth. you can have it be a binary system with the Nauceans home star orbiting far enough away to not affect planet formation too much, but close enough to affect climate. 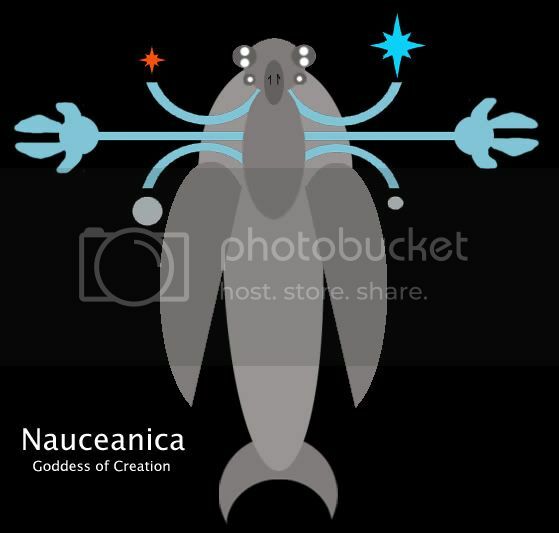 This is Naucean the Creator Goddess. She is like Gaia or Mother Earth on the planet. She is all things and balances nature and the ecosystem. As you can see she is holding Au (the small dwarf star) and the Blue Super Giant in the other hand, which both warm the planet. In the other 2 tentacles she is holding the orbiting moons Sina and Sirenia. And the last 2 tentacles are out like a balance showing the balance as well as open for a hugging embrace.